One of the wonders of the ancient world. Grand in every way. Covered in gold and fine stone, it was a temple worthy of any god in the heavens above or the earth below. And it belonged to the Creator King who was the ultimate King of Kings over all of creation. Only he didn’t want it. His heart – nay, his passion – was to reside among his people. To walk and to talk with each one as they plowed the fields, cared for the sheep, washed the dishes and took out the trash. He was – and is- an inmate King who loves his people more than they could ever know. And his people…well, while they loved him greatly, they were disappointed, and perhaps even a bit embarrassed, at their god’s lack of a proper etiquette. Everyone knew that gods were supposed to reside in massive temples whose shadows covered the land. So they build him such a temple. And being a loving Father, the Creator King praised the works of his people like a father or mother who gushes over the crafts of a young child. For while the building was nowhere as nice as the original temple he had built, the Creator know how much it meant to us. We, humanity, needed something physical – something massive – something awesome – something that stood out – so that we could remember who we worshiped. For we have a short memory and a tendency to forget our mission. So we build a temple. A place where we could go when we are sad…a place where we can go when we are happy…a place where we could be reminded of what was important. He used our perhaps-not-so-good desires to create something beautiful. A symbol of something that was and is and would one day be. 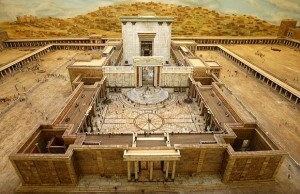 Solomon’s temple: a place that called into memory the original temple while looking forward to the ultimate temple in addition to standing strong to remind the people of Him-Who-Should-Always-Be-Worship. This is part five of an eight part evolving art piece currently on display at the Vineyard Boise art gallery.